Discover more about meetings held at Linnwood Hall, Guildford (Sydney). group that meets near you. Many a lacemaker has taught herself to make lace, with the help of a beginner's text. You can do it! "Introduction to Bobbin Lacemaking" by Rosemary Shepherd is an excellent text. It is based on a correspondence course she wrote when the lace guild started in Australia, and so is designed for self-teaching. 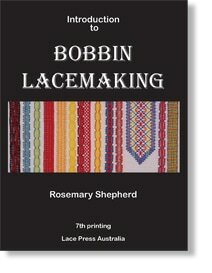 You can obtain the book from Rosemary or from Rochelle Sutherland who keeps lacemaking requirements. This book is also available in our library, along with self-teaching DVDs. before making the excursion to the MAAS at Ultimo, Sydney. The MAAS is also called the Powerhouse Museum.